Have you ever been walking along a groomed hiking path when you come along a tree with an anthill so high you nearly miss it altogether? It’s quite an amusing and frightening site. While an infestation is much more likely to occur in the wild where it will spread with abandon due to lack of control by humans, it can be addressed when a similar scenario takes place in your backyard. Trees are home to many living things. Birds, bees, squirrels, chipmunks, owls, and pests of all sorts live together harmoniously. Trees are also occupied by fungi and are a source of food, water, and even air. They are essential beings for so many important creatures including ourselves, but there is a difference between making a home in a tree and taking full control. You don’t want the ant infestation to spread to your home or shed. The takeover could cause substantial damage to your tree, which could lead to undetermined amounts of damage if it causes its collapse. Instead, you should contact a tree company to assess the situation and provide appropriate solutions. 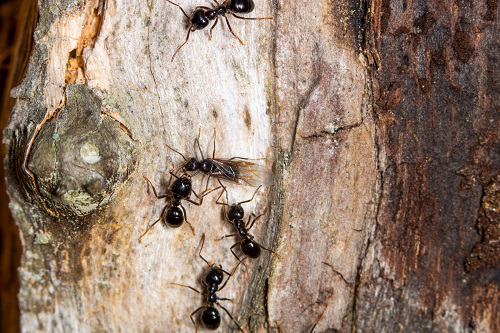 The most common type of ant you’ll find lurking in your trees is a carpenter ant. This large, black ant nestles into trees that are older and hollow or rattled with dead or decaying wood. For this reason, if you see ants, an alarm should be going off in your head that your tree might be at real risk of falling as it’s dying. You might surmise how this could happen to your adored backyard tree, but carpenter ants aren’t the cause, but rather opportunists that feast upon a tree that’s already weakened by injury or dying without previous signs to alert you of the situation. Once the tree is in decline, carpenter ants strike and may extend the damage by making nests in otherwise healthy parts of the tree. This is done by chewing temperature-controlled tunnels into the wood and discarding the sawdust outside. In fact, according to American Forests, ants create as much as 30,000 pounds of soil per acre each year. If that’s the case, you will likely also notice sawdust piles at the base of your tree. Again, while we recommend reaching out to an arborist or tree specialists at this point, there are over-the-counter insecticides that can be purchased and applied directly into the ant nests of the tree. Another solution that is less invasive is insecticide goes on and around the trunk and base of the tree. However, no matter what you try, it will not likely rid your tree of carpenter ants; simply reduce their army. While an arborist may have further recommendations, there isn’t much that can be done to completely eliminate an ant infestation in your tree. And while tree removal should not be the immediate course of action, continued attacked by these insects will lead to the eventual removal of your tree. However, the first thing you should keep an eye out for is the spread of carpenter ants from your tree into your home. These ants have been known to travel from tree to home destroying door sills, window frames, deck boards, and other items made from wood. However, even this is preventable. The key is to reduce the moisture in your home. If you have a continuous moisture problem, this risk will increase and can lead to severe damage if not properly addressed. Interestingly, the ant-tree relationship is mutually beneficial in some instances. In the Tropics, there are actually trees that have evolved in tandem with ants. When this occurs, the tree will provide the ants with special structures to live in or protein-rich food. In return, the ants aggressively patrol the tree and protect it from herbivores like caterpillars. While our knowledge of direct mutualism between ants and trees is limited, we do know that indirect mutualism does occur in forests. While a tree is a natural home for ants, the ants then feed on the herbivores trying to snack on the tree and the ant waste benefits the tree. So, before you jump to the conclusion that if you see ants you have an issue with your tree, be sure to consult a professional. Even when the ants do eventually come for your tree, sometimes it was just part of the circle of life. Trees do last for many years, decades even, but they too will eventually parish. It’s a natural process for ants to come in and take control. In fact, without ants the forests we love to explore would be littered with rotting wood. It’s an important and necessary step for ants to colonize trees. They need trees just like the forest needs trees. It’s this reason why ants and trees go together, though more like frenemies than friends. And yet, we still want to eliminate ants in hopes of protecting our tree. While our instant comes from the right place, we must consider our landscape as well. Are the ants causing the tree harm? Is the tree still healthy and thriving? Is the tree at risk of falling? Are the ants encroaching beyond the bounds of the tree? These are all important questions to ask your local tree professional. Remember, if tree removal is the first reaction upon inquiry, it’s likely best to get another opinion. However, no matter who you choose to address your ant infestation issue with, make sure to do the upfront work to ensure the company is reputable. Ensure that the workers are certified, licensed, and insured. Ask for an estimate, and for references and recommendations from trusted family and friends. If you are facing an ant-tree battle, turn to the experts and you’re sure to find a solution that works for you.